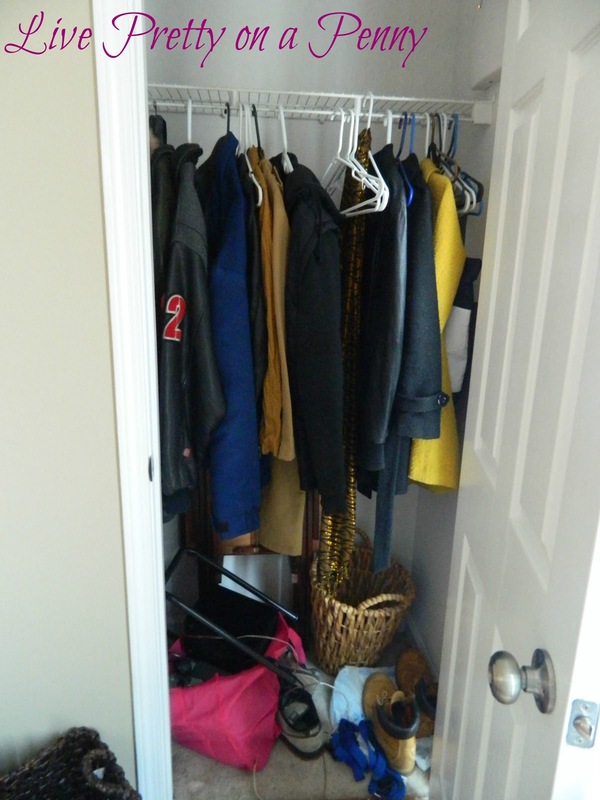 Entering our home, the coat closet sits to the right of the front door. Yet, it was still one of the most under utilized spaces in the home. Over the past year, it sort of became the dumping ground for anything that didn’t have a place anywhere else in the house. Now that it’s getting cold and close to the holidays which usually means more visitors, I felt it was time to get this area together. Not to mention, the icing on the cake was when I came home, and tripped over my husband’s work boots that were in the middle of the floor. Enough became enough. So it was time to do something about using this space properly. This is seriously how it looked. I can’t make this stuff up. A solid waste of space. Much more useful and pretty! Now that you’ve got the urge to do the same, let me show you how we did it! First, we removed everything out of the closet and decided what really belonged and what did not. For ours, we wanted to keep coats and shoes of course, but also other items such as our dog leashes, cd books for the car, shoe sprays ( for hubby’s boots), and other things. So we knew we would need ample covered and uncovered storage, and to figure out a way to make good use of the entire closet space. I started by painting the closet with leftover paint that I used for my general areas (Behr Castle Path). It was originally pure white. Once painted, we decided to add some shelving to the bottom in order to make use of the vertical space for shoe storage. We built the shelves using one 1×4 cut into the three pieces as the brackets to support the shelves, and one 1×8 cut into two pieces to make the shelf. *As a note, the longest bracket should serve as the length of the closet, while the shorter brackets should only be as long as you would like for your shelf to extend out in the closet. Just make sure it does not extend too far out, or else you won’t be able to close your door. Ours extends a little over half the width of the closet. 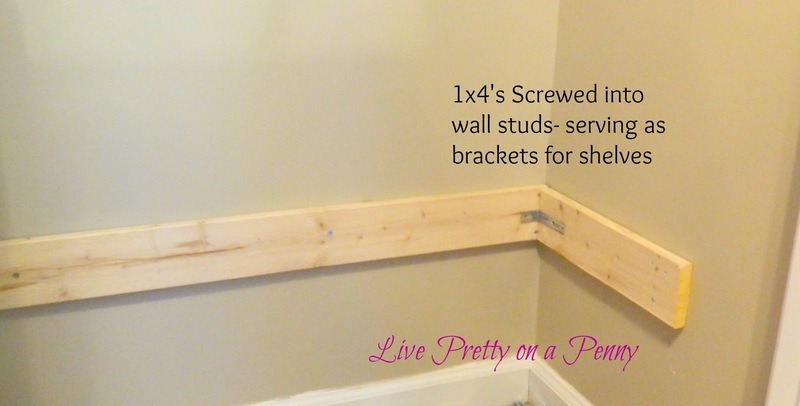 Once the brackets are secured, place the 1×8’s on top and screw them into the 1×4’s using wood screws. Following placement of the shelves, I went ahead and painted them white using some leftover paint. Next, I knew I wanted to do something to add to the “pretty” of this project. 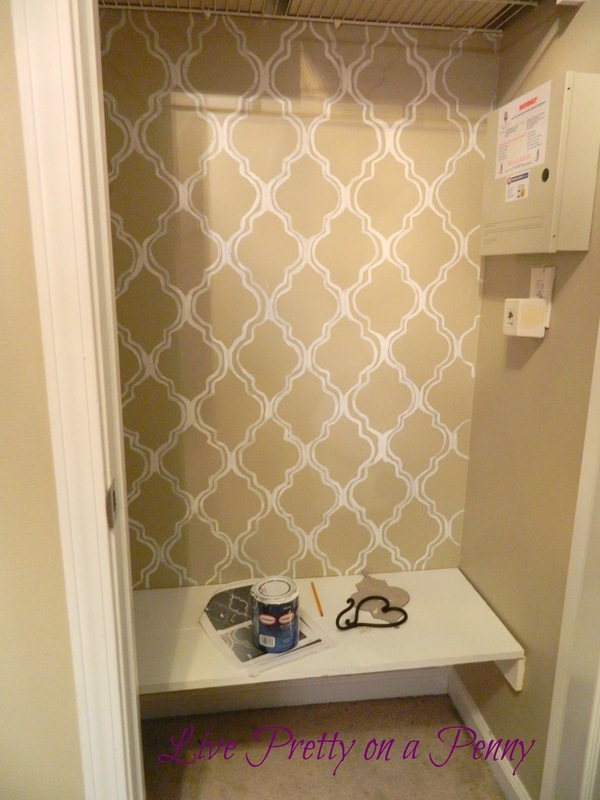 Being that I wanted to stencil somewhere in my house, I thought the closet would be great practice:) After searching some stenciling choices online, I came across this great free stencil template. Yes, free! So of course I had to try it. I printed this template out, traced it on cardboard a got to work tracing it on my closet interior. 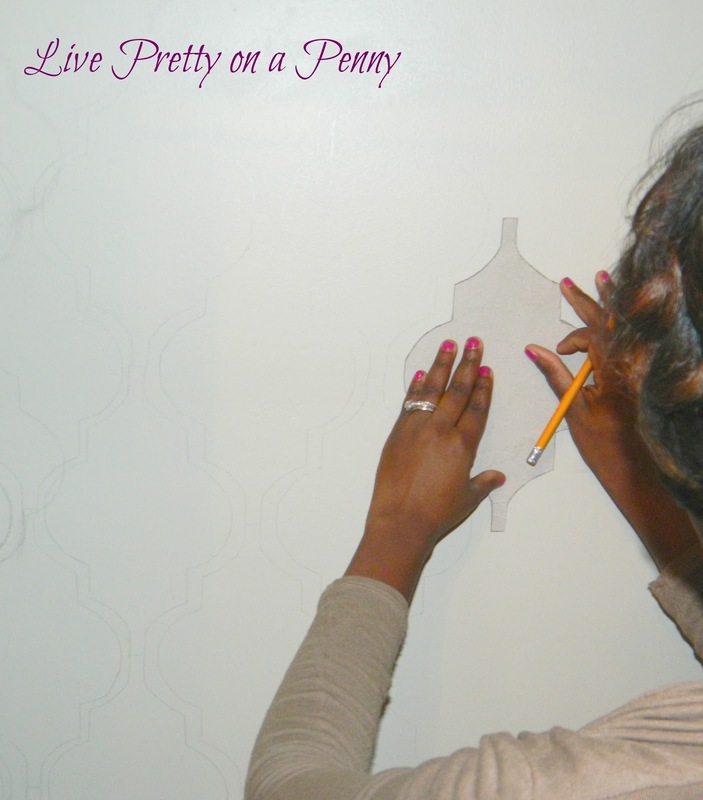 I am going to spare you guys the lengthy step by step of stenciling. For a more detailed tutorial on stenciling, click here. Its so pretty! Too bad it’s covered with coats! We then put the coats back into the closet, along with my husband’s work boots, my rain boots, and other shoes that we use in the backyard, etc. We also added some additional storage to the bottom and over the door hooks for scarves, hats, or my purse. Thats pretty much it. I am so happy that I took the time to take on this closet. It was much needed. It also allows me to check out TWO things on my 30 by 30 list…woo hoo! Here she is again in all her glory. All in all, this project cost me about $50, with the purchase of the storage containers, 1×4 and 1×8 from The Home Depot. 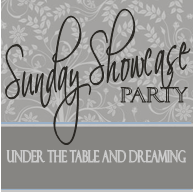 Everything else I had on hand, and of course the stencil was a free printable. 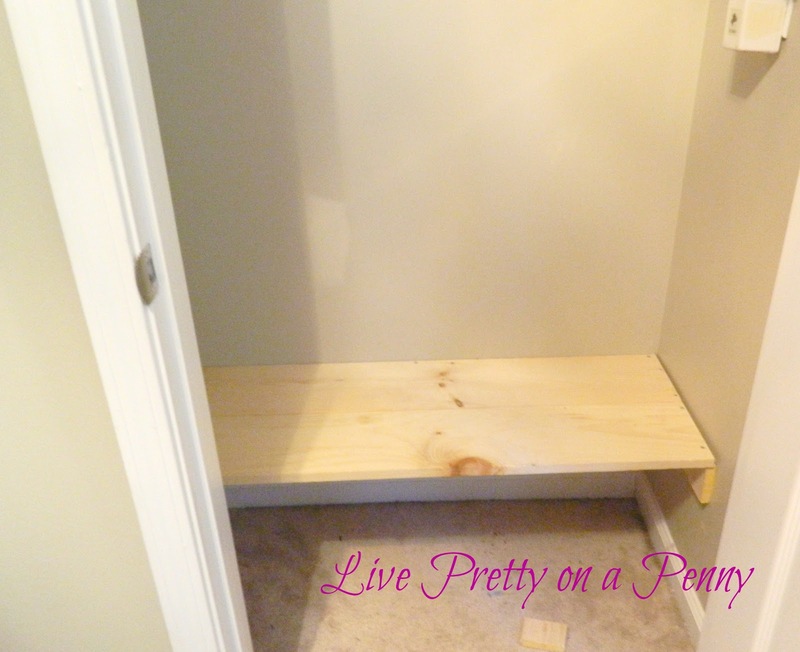 Do you have any closets in your home in need of some TLC? 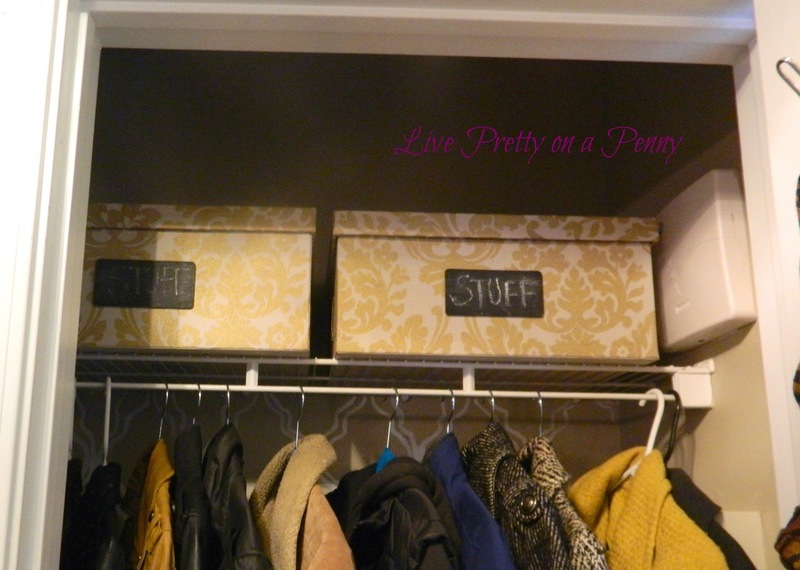 What are some of the ways that you keep your closets organized? Please share! I need all the help I can get. Oh Erin, I love what you did with your closet. So clever to add the shelves for extra storage space. I love the stencil too. It gave the closet so much character. It's more like a room now! Thanks Brandi! 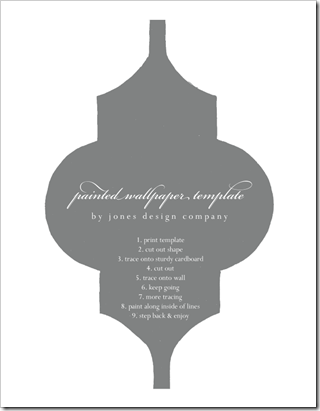 I plan to use more stenciling in my home! It looks great! 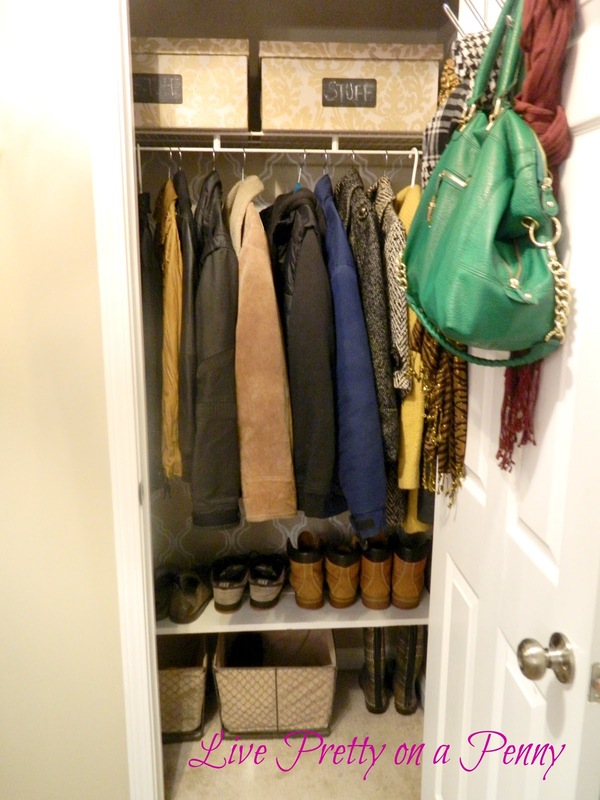 I so need to do this to our coat closet. It's always such a mess and the place we just cram everything when company comes! 🙂 I love the stencil you used as well! SO pretty! Thanks Ellora. We did exactly the same thing, cramming stuff in the closet. But this is so much better. Good luck should you decide to tackle yours. Thanks for stopping by! This is SO what I need to do in the hall closet! Great ideas! Oooh, I love it. My coat closet is the first thing you see when you walk into my apartment and my mom just asked, "Ugh, what are you going to do with that closet?" LOL…this is a great idea, although I probably couldn't nail anything in the wall or stencil since I live in an apartment. Any ideas? Hey there. Yeah since you cant nail or paint, you could just use pretty boxes to accomplish the same thing. Or fabric covered boxes. Nice hangers from Marshalls or Tjmaxx. They come in a variety of colors. Let me know if you tackle it.